A couple of days earlier the smartphone market witnessed two quick releases from HTC. HTC titled these two amazing gadgets as ‘HTC ONE V’ and ‘HTC ONE X’. Previously there were a lot of speculations and comparisons between the super hyped smartphone Samsung Galaxy S3 and HTC ONE X. A latest addition of smartphone has been made to the HTC ONE series called as ‘HTC ONE S’ and is now currently available in the market. The phone is already available on eBay and is priced to about to Rs. 36,000 which is very close to the price range of HTC ONE X. Both these gadgets are loaded with tons of features and applications which any top class phone must have. Now you might get a doubt why is HTC releasing two phones around the same range in the same series. Well, all those doubts will be cleared as we present you the technical specifications of the ‘HTC ONE S’ in comparison with ‘HTC ONE X’. The HTC ONE X comes with a dimension of 134.4 x 69.9 x 8.9 mm whereas the HTC ONE S has a dimension of 130.9 x 65 x 7.8 mm. This slight change in dimension makes the small design change to be clearly noticed. ONE S weighs about 119.5 g which is about 10 g less than its predecessor, which weighs to about 130 g. The new entry finds itself an upper hand as it looks more compact in size and also due to its low weight. The HTC ONE X comes with a ‘Super IPS LCD2 capacitive touchscreen’ where as the latter comes with a ‘Super AMOLED capacitive touchscreen’. This is one of the major differences in the display of both the gadgets as Amoled display nowadays is a quick pick amongst the buyers. The predecessor comes with a resolution of 720 x 1280 pixels with a size of 4.7 inches whereas the latter comes with a slight lower resolution of 540 x 960 pixels, the size being 4.3 inches. The new HTC One S is loaded with a ‘Qualcomm Snapdragon S4 dual-core SoC’ processor with a 1 MB L2 cache. This is the only mobile processor in which each core can be clocked independent of the others, which would cut down the power usage. The processor runs at a speed of 1.5 GHz and comes with an integrated Adreno 225 GPU which supports Direct 3D 9.3 and can operate at speeds up to 400 MHz. The HTC One X is loaded with ‘Nvidia Tegra 3 SoC’ processor. Tegra uses an ARM Cortex-A9 quad-core CPU which works at about 1.5 GHz. The interesting part of it is that this also operates on a fifth core called as the Companion core which uses low power and runs at a speed of about 500 MHz, which gets activated when the system is idle. This results in the lower power consumption of the device. Here the predecessor has an upper cut due to its quad cores whereas the other one operates on dual core. Both the devices come with a similar rear camera of 8MP with LED flash. The camera is capable of taking images up to a resolution of 3264 x 1840 in the 16:9 aspect ratio. Also the camera is capable of recording full HD videos. But the playback of such high resoultion HD videos at full speed is not that good. HTC also has induced a new technology called as the HTC IMAGE SENSE. This makes it possible to take rapid multi snaps sequentially at a speed of 4 snaps per second. This features is limited to digital SLR Cameras. Talking about the front cameras the ONE S comes with a 640×480 (VGA) camera where as the One X has a 1280×720 (720p) front camera. Both provide good video call support but the 720p camera makes it look a lot better. Both the devices are loaded up with the last updated Android operating system by Google i.e..the v4.0.3 ICE CREAM SANDWICH. 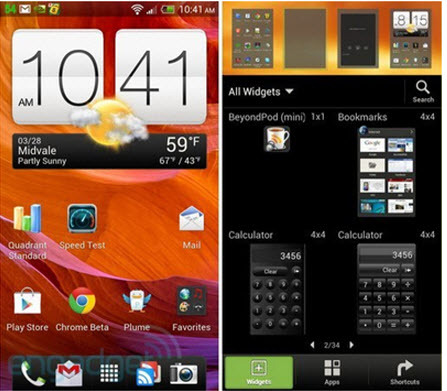 The ONE series uses the HTC SENSE 4.0 UI which is a modified user interface to the original OS. Users here get a lot of options and can personalize the device screen as per their choice making it easy for the users to use the device at their convenience. The HTC ONE S comes with an internal storage memory of 16GB with a 1GB RAM whereas the HTC ONE X comes with an internal storage memory of 32 GB with 1GB RAM. There is a big disappointment to the gadget lovers as both the devices do not come with an expandable memory slot. ONE S comes with a standard Li-Po 1650 mAh whereas the ONE X comes with a standard Li-Po 1800mAh. This gives an upper edge to the ONE X as it has a larger backup and the low power consuming 5th core of the TEGRA makes it even more power efficient. HTC ONE X beats the latter in terms of battery, front camera, number of CPU cores and internal storage memory. ONE S has its own advantage of having a sleek design with a light weight body. Also the latest Snapdragon processor makes a difference in the performance due to its interesting feature of the ability to clock cores independent of others. HTC ONE S is new, so let’s just wait and watch how it performs in the market when compared to its predecessor which gave a strong fight to the GALAXY S3. Coolpctips appreciates the amazing strategy of HTC by using their own product to compete with HTC One X. 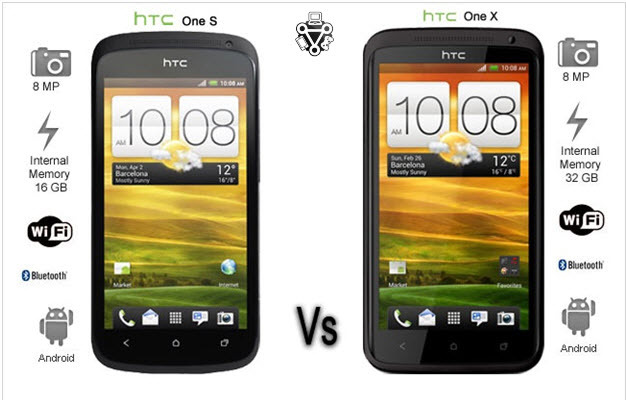 Previously HTC One X was competing with Samsung Galaxy S3 and Other top smartphones. So what do you think about this ? Please drop us a line if you have anything to share about HTC One S and HTC One X. How much does that HTC one X cost? flipkart prices HTC ONE X to about Rs. 36099 approx. and ebay india prices HTC ONE S to about Rs. 36,157.00 approx.